Oil spills, especially the big ones, can cause irremediable damage to the local ecosystem. Unfortunately once in a while, there’s a catastrophic disaster either from an oil rig or oil tanker leak, but these are the big ones – the ones you hear about on TV, since frankly anyone today with an internet connection can check facts out via satellite imaging. Smaller oil spills, ranging from oil-drilling mishaps to ships discharging fuel, aren’t reported at all in the media, and according to a recently published study, they’re underreported by oil companies in attempts to disguise the level of damage they’ve caused. Now, the problem isn’t that big oil is lying about some oil spills. The actual number of reported oil spills, minor or not as mandated by US law if petroleum or derived products wash up in US waters, is rather solid. The lying takes places in the actual size of the oil spills, which are almost ubiquitously reported as being smaller than they actually are – a lot smaller. The study was conducted by oceanographers from Florida State University (FSU) in Tallahassee, in collaboration with SkyTruth – a non-profit that tracks oil spills using publicly available tools like satellite images, on a mission to aware the general public on the real magnitude of such unfortunate events. Florida State has access to a database of much higher resolution satellite images, obtained via synthetic aperture radar (SAR), previously used to study slicks formed by natural oil seeps – rather the perfect tool for anthropomorphic slicks as well. The researchers identified sites of accidental slicks and then inputted the images in a special software that can differentiate the presence of oil from water texture. This allowed the researchers to calculate the respective slick area. The results were startling as most of the slicks caused by human hand were typically about 13 times larger than the estimates delivered by oil companies to the National Response Center. The team involved in the study acknowledged on the plus side, though, that the number of actual spills is correctly reported. “It is not surprising that there are discrepancies” between the radar images and the assessments reported to the Coast Guard, says Emily Kennedy, a policy analyst at the American Petroleum Institute, an industry group in Washington DC. “Remote-sensing applications can be challenging, since they often provide false positives because of natural phenomenon like sea kelp.” She notes that such images require a lot of “ground truthing” — confirming that the image shows a real slick by visiting the site, for example. 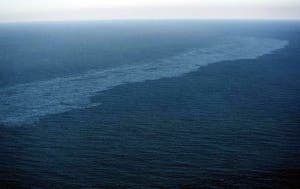 Oil companies are mandated by the Coast Guard to reported any oil spill, big or small, otherwise they risk legal repercussions. However, there aren’t any legal repercussions for supplying false estimates. Typically, fines are issued proportional to the number of barrels spilled, but these are rarely pursued in the case of small slicks.